41 Commercial Real Estate & Properties in St Albans are listed in 4 categories. We have 27 Development LandsSale & Lease , 8 Retail ShopsSale & Lease , 5 Medical and Consulting PropertiesSale & Lease and 1 OfficesSale & Lease . Retail Shop In Main Road Location Affordable Retail Investm..
On busy Main Road West within walking distance to the upgraded St Albans station and all other facilities, currently leased at $32,400 per annum, with a building area of approximately 80m2 on a substantial site of 180m2 approx with ROW access. This is your opportunity to purchase a retail property in a prime location. Two Homes In Superb Location! DOUBLE INCOME! Two units on one title, Live and Invest in this outstanding St Albans east location The large and comfortable front home offers an abundance of natural light, 3 good sized bedrooms, kitchen with meals area, lounge and dining rooms. heating and cooling The near new modern home at the rear offers 2 bedrooms with robes master with a walk in robe and ensuite, modern kitchen and dining with a gas cook top. Both properties come with separate services. Live and invest, invest or separate family accommodation, your choice! Your Rhode To Success! Shop Plus 2 Bedroom Dwell.. 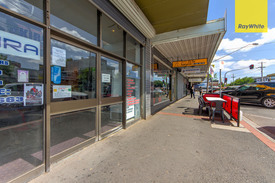 KEBAB SHOP OPPORTUNITY (STCA) Provide your own Caravan or Pop up shop on this prime location Hardstand approximately 250m2 Ample on site parking Main Road street frontage Power and water available Located within the heart of St Albans close to all amenities including Victoria University and Shopping Centre. Contact Helen Lipman on 0477 006 134 for an details today! Total area 200m2 Fully fitted out bar with fridges, coffee and ice machines and cooking equipment. 2 outdoor balconies Billiard table Located above Furlong Bottle Shop and opposite Ginifer train Station. Contact Helen Lipman on 0477 006 134 to arrange an inspection today! Double The Potential MEDICAL CENTRE? 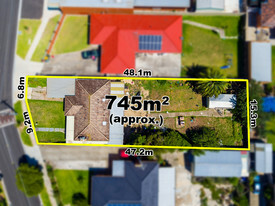 Attention all investors and developers, two properties on one title, set on a generous allotment of approximately 724m2 in Residential Growth Zone, rental returns currently $3000 per calendar month. Unit 1 Ex medical rooms, consist of four bedrooms, separate bathroom and toilet, open lounge, functional gas appliances, heating and cooling. Unit 2 3 bedrooms with BIR's, 2 bathrooms and separate toilets, gas appliances, heating and air con, Minutes from new St Albans train station, Alfrieda shopping precinct, Schools, Medical clinic and Western Ring Road, invest now for a bright future rewards. Rgz With 33.7 Metre Frontage RGZ DEVELOPMENT SITE? Executors Auction! MAJOR GROWTH ZONE CORNER!